Boston born Mike Vienneau grew up in Duxbury, MA before eventually acquiring a BFA in Printmaking and Painting from what is now known as UMASS Dartmouth in 1981. During that time, Mike kept busy making ivory pendants with the skull and roses emblem of the Great Dead for friends and classmates. 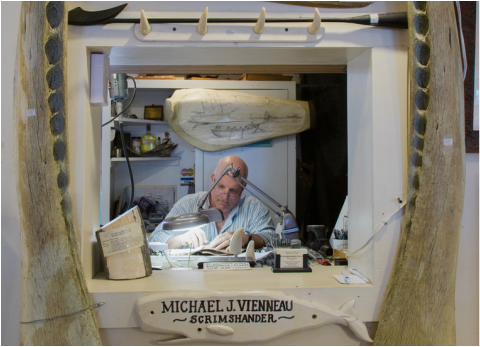 When asked about his beginnings in the art of Scrimshaw, Vienneau says: "I began scrimshanding in my early teens born from a mixture of boredom, curiosity, and a competitive spirit with my older brother Larry. My first sales came when I was in college, affording me pocket money. During summer breaks on Nantucket, starting in 1974, my first scrimshanding gig was at Whale’s World Gifts, (upstairs from my current location at 38 Centre St) and my professional career commenced. " After 16 years of free-lance work, including landscapes on canvas as well as some sign painting, Mike opened Scrimshander Gallery on Old South Wharf in 1990. The gallery remained open in that location for 22 years, then moved to it's current location at 38 Centre Street. Currently, Mike lives on Nantucket with his wife, Barbara, and dog Millie, who often puts in hours at the gallery with her owner. The process of scrimming is a historic and dwindling art form, kept alive only by highly skilled, dedicated artisans, often living in the geographic areas affected by whaling. Take a look into the process our artist uses to make these pieces.